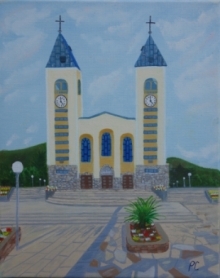 This is one of the most discussed topics on the subject of Medjugorje: Pilgrimages. b) Then, if this examination appears favorable, to allow certain public demonstrations of cult and devotion, while continuing to investigate the facts with extreme prudence(which is equivalent to the formula: “for the moment, nothing is opposed to it”). With that in mind, you may notice two common threads in each of these communications out of the Bishop's conference and the Vatican. * All point back to the 1991 Zadar Declaration for the Church's current position on Medjugorje: Non constat de supernaturalitate. * All communications use a qualifier with regards to pilgrimages. There is no official outright ban. They are permitted conditionally, but may not be organized by any bishop, diocese, parish, or other group AND on condition they do not give authentication to the events at Medjugorje. This is because the cult following has not been granted, which can only be granted once positive and negative criteria have been assessed favorably. "I have no authority to pronounce any ecclesial judgement whatsoever on the events of Medjugorje. I am therefore the first to have to give an example of obedience, notably in respecting the pastoral decisions of my confrere of Mostar and in complying with joy to his wishes. "I do not see how I can go to Medjugorje without giving my support, by the very fact of my having come there, to the events who's discernment and assessment rests henceforth with the Episcopal Conference of Bosnia-Herzegovina. Such support would fly in the face of a traditional teaching of the Church, recalled in Lumen Gentium and applicable to all the successors of the Apostles: "Individual bishops, in so far as they are set over particular Churches, exercise their pastoral office over the portion of the People of God assigned to them, not over other Churches nor the Church universal." And now, for the communications we have to date on pilgrimages, in chronological order. While waiting for the results of the Commission's work and the Church's verdict, let the Pastors and the faithful honor the practice of the usual prudence in such circumstances. For that reason, it is not permitted to organize either pilgrimages or other religious manifestations based on an alleged supernatural character attributed to Medjugorje's events. Marian devotion, legitimate and recommended by the Church, must be in accordance with the directives of the Magisterium, and especially the apostolic encyclical Marialis Cultus February 2, 1974 (cf. AAS, 66, 1974, p. 113-168). In your letter of February 14, 1996 you inquired what is the present position of the Church regarding the alleged "apparitions in Medjugorje' and whether it is permitted to the Catholic faith to go there for pilgrimage. ". . .On the basis of investigation up till now it cannot be established that one is dealing with supernatural apparitions and revelations. However, the numerous gatherings of the faithful from different parts of the world, who are coming to Medjugorje prompted both by motives of belief and certain other motives, require the attention and pastoral care in the first place of the bishop of the diocese and of the other bishops with him so that in Medjugorje, and everything related to it, a healthy devotion toward the Blessed Virgin Mary would be promoted in conformity with the teaching of the Church. The result from this, in what is precisely said, is that official pilgrimages to Medjugorje, understood as a place of authentic Marian apparitions, are not permitted to be organized either on the parish or on the diocesan level, because that would be in contradiction to what the Bishops of former Yugoslavia affirmed in their fore mentioned Declaration. "You cannot say people cannot go there until it has been proven false. This has not been said, so anyone can go if they want ... When one reads what Archbishop Bertone wrote, one could get the impression that from now on everything is forbidden, no possibility" for Catholics to travel to Medjugorje. But, in fact, "nothing has changed, nothing new has been said ... The problem is if you systematically organize pilgrimages, organize them with the bishop and the church, you are giving a canonical sanction to the facts of Medjugorje ... This is different from people going in a group who bring a priest with them in order to go to confession ... I was worried that what Archbishop Bertone said could be interpreted in too restricted a way. Has the church or the Vatican said no (to Catholics visiting Medjugorje)? NO. ... The difference, in the terms of canon law, is that an official pilgrimage, organized by the diocese with the bishop, is a way of giving a juridical sanction to the facts; you are saying this is true." In regard to this matter, I think it is impossible to reply to each of the questions posed by Your Excellency. The main thing I would like to point out is that the Holy See does not ordinarily take a position of its own regarding supposed supernatural phenomena as a court of first instance. As for the credibility of the "apparitions" in question, this Dicastery respects what was decided by the bishops of the former Yugoslavia in the Declaration of Zadar, April 10, 1991: "On the basis of the investigations so far, it can not be affirmed that one is dealing with supernatural apparitions and revelations." Since the division of Yugoslavia into different independent nations it would now pertain to the members of the Episcopal Conference of Bosnia-Hercegovina to eventually reopen the examination of this case, and to make any new pronouncements that might be called for. That statement I've highlighted in green, has been severely distorted by promoters of Medjugorje. It has been presented in such a way as to lead readers to believe he has been "stripped of his authority". The bishop made clear in that letter he was speaking for himself because in the succeeding paragraph, he invites the Church to take on the matter for further study. More these kinds of distortions in a later post which will be linked here.